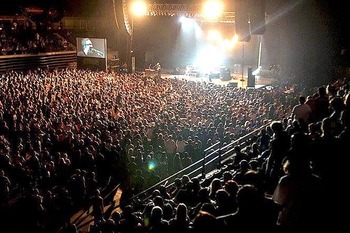 BATON ROUGE, Louisiana – Based in the capital of Louisiana, complete audio systems integrator Premier Production & Sound Services, LLC (PSS) is known for its dedication to providing the best audio designs to a wide variety of venues and events including festivals, concerts, university functions and corporate conferences. A major factor contributing to the company’s success is its use of HARMAN’s JBL, Crown and Soundcraft equipment, generating integrated solutions that are impressive in quality and consistency. To deliver a full turnkey audio system at the limited 325-seat Manship Theater for the Manship Red Carpet Gala Fundraiser featuring GRAMMY®-winning Rick Springfield, PSS stacked three JBL VTX V25 line array loudspeakers per side from the ground up, on top of three VTX S28 subwoofers in cardioid configuration and a VTX V25-VT vertical transporter per side, with four VERTEC® VT4886 subcompact line array loudspeakers serving as front fills. Also, four VT4886 loudspeakers on top of three VT4883 subcompact subwoofers per side in cardioid configuration served as side fills, supported by two VT4883 subs with four VT4886 for drum fill and 16 SRX712M stage monitors. The entire system was powered by 36 Crown I-Tech 12000HD and nine I-Tech 4x3500HD amplifiers, and mixed with a Soundcraft Vi6 digital console. In addition, the Our Lady Of the Lake Foundation held its 29th Annual Gala at the Baton Rouge River Center, hosting a show for the regional Our Lady of the Lake hospital, starring the blue-eyed soul staple, Hall and Oates. PSS came through with eight JBL VTX V25 and four VT4886 downfill enclosures and six S28 subwoofers in a cardioid configuration per side, supported by four VERTEC VT4888 midsize line array loudspeakers and four VT4886 downfill per side for out fill and four VT4886 loudspeakers for front fill. The system was again powered by 36 I-Tech 12000HD and nine I-Tech 4x3500HD amplifiers, while the Soundcraft Vi6 served as the master control console. “The D2 driver is the most amazing thing I’ve ever heard, virtually eliminating half-order distortion, greatly reducing 2nd-5th harmonic distortion, and virtually eliminating modal-breakup to beyond the limits of human hearing in the extreme high-end frequencies,” stated Gordon. Lastly, the Groovin’ on the Grounds concert at Louisiana State University allowed PSS to showcase its ability to put out a tremendous amount of power through its JBL system, which included 12 VTX V25 loudspeakers per side and nine S28 subwoofers per side, with eight VT4886 loudspeakers as down fills. All units were flown, except for four VT4886 loudspeakers and six SRX728 subwoofers on the ground functioning as front fills. All 39 Crown I-Tech 12000HD and 15 I-Tech 4x3500HD amplifiers were used to power the system, while the Soundcraft Vi6 console was used for FOH and monitors. For all three shows, JBL HiQnet Performance Manager™ and HARMAN HiQnet Audio Architect™ were used to design and adjust the system configurations. “With Crown amplifiers we have been very happy with the rock solid stability of the I-Tech HDs. The improved filters and V5 presets have made the combination unstoppable and we have been equally impressed with the newer 4x3500HD amplifiers which allow us to greatly diversify amp racks to do many different configurations,” added Bryant.